During my sessions in the office 365 DevCamp in Atlanta, I have demoed how to build applications for Office (Word & Outlook) and How to integrate with Office 365 API from ASP.NET MVC application. 1) Word Application: Read items from SharePoint lists and interact with a word document. 2) Outlook Mail App: An app that read email messages content and extract links within the message and has the ability to add these links to SharePoint lists. 3) MVC Research Tracker App: an MVC application that is connected to office 365 tenant and read user's contacts, files (from OneDrive) and add content to SharePoint lists. These applications you can download, register these apps against your Office 365 tenant AD and run them (F5) and have fun! I have uploaded the manifest files as well, that contains the registration information i have for each of these applications in my office 365 tenant Active Directory. These files are json files, you can open it in Notepad and configure the settings and permissions as needed. DON'T copy any Auto Generated Ids such as client id or AppKey. Happy memorial day! I am posting this blog post to share my study notes for Implementing Microsoft Azure Infrastructure Solutions exam. 2) How to configure a cloud service to join a VNet in Azure by updating the csdef file. a) Create a VPN Subnet. b) Enable Point-to-site connecting to Corp VNet. 2) Using DirSync with Azure Active Directory (AAD) to synchronize on-premise AD to AAD. 3) Working with Access Control Services in Azure. 4) How to configure an application as a multi-tenant application. 5) Active Geo-Replication is available in the Premium Services Tier. 6) Managing access to anonymous and external users using access policy in Azure Storage. 7) All logs are stored in $logs container when storage analytics is enabled. 8) Deploy protection between two on-premises VMM sites. 9) Configure custom script extensions in VMs. 10) How to configure Data Protection Manager (DPM) with Azure backup service. 11) How to enable anonymous users to access blob storage container in Azure. a) Setup a DirSync Server. b) Setup an active Directory Federation Services Server. 13) Work with Graph API RESTful endpoints in Azure AD in SaaS apps. a) Send: for all send operation. b) Listen: opens up listeners and receive messages. c) Manage: to observe or manage the state of the service bus tenant. 15) Use Monitor page in Azure portal to setup metrics for your webroles. 16) Use Configure page in Azure portal for endpoints and rules for yor webroles. 17) To control access to VM, use Set-AzureAclConfig PS Cmdlet. 18) To add disk to a VM, use Add-AzureDataDisk PS Cmdlet. 19) Connect branch users to your corp network using: Site-to-Site configuration in Azure. 20) Connect remote users to your corp network using point-to-site configuration in Azure. 21) Free and Shared provides 1GB of Data in Azure as storage. 23) Standard provides 50GB of Data in Azure as storage. 24) Copy Databases using BACPAC from one server to another using blob storage. a) Add local networks to the VNets. b) Create a dynamic Routing Gateways. c) Connect the VPN Gateways. 28) You must be Enterprise and Global Admin to run Directory Sync Tool. 30) You need to enable VM extensions checkbox while provisioning a new VM. 31) Select-zureSubscription -SubscriptionName "NAME" -Current ->to set current subscription. Where JobType could be continuous or triggered. Hope these notes will help you pass the test! drop me a line if you have any suggestions! If you are experiencing that cloud service web roles are slow for the first call or request, this is due to the default IIS Application Pool setting is set to recycle after 20 minutes. This means, that every 20 minutes of inactivity, the application pool will recycle which means any request after this period will experience slow load time that you need to avoid for your customers. If you have Azure Web Application (websites), you can easily configure this by turning on Always On switch in Azure Management Portal under Configure tab and you will be able to get your site faster to load! 2) In the Startup folder, right click and add a new Text File in VS 2013. This command sets the IIS recycle app pool setting to zero which is never recycle! Make sure to test out the cmd file by running it form the command prompt as admin, the output of the command should look like this below figure. 5) Select the Startup.cmd file in VS 2013 and press F4 to change the file properties. 6) Set Copy To Output Directory to Always Copy. 7) Save you changes and build your website, make sure that you have startup folder in the bin folder. 8) Publish your cloud service and check the difference for the first time you call the site after the deployment! If you have missed or couldn't attend BUILD event where Microsoft announced tons of cool things in Windows 10 features, Open Source, Universal Apps, Edge (New IE), IoT and Unity news for Game Developers. Microsoft is providing a free training course through Microsoft Virtual Academy (MVA) that cover all what you missed in BUILD 2015 that was held on April 29 - May 1, 2015. In this blog post, I am providing a walk-through on how to setup custom SSL certificate into Azure cloud service. In any cloud service project, you may have multiple web roles that you need to configure some or all of them using SSL certificate. 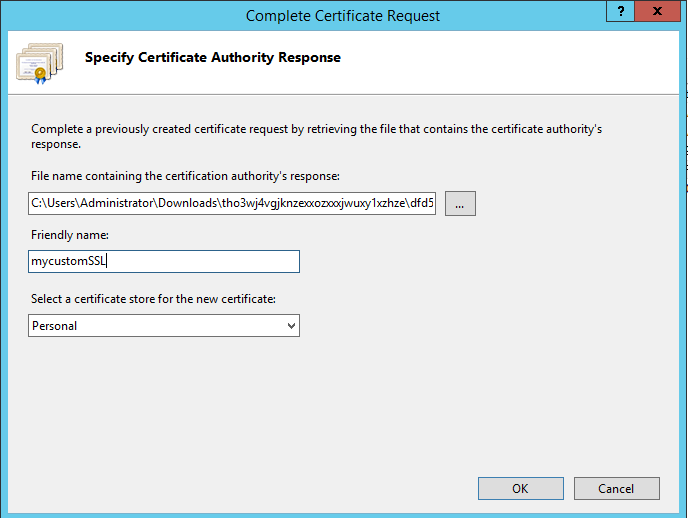 Since Certificate authorities (CAs) don't provide a pfx file to configure and upload into windows azure, there are some work you need to do once you get the CA response which in some cases it is different formats for the ssl certificate. For example: GoDaddy provides a zip file which contains .crt (which is your custom domain certificate response) and .p7b file which is set of intermediate certificates used to authenticate your certificate to the root GoDaddy certificate. 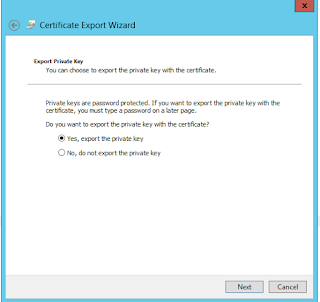 1) Windows azure accepts only SSL certificate with personal exchange information extension (.pfx). 2) SSL certificate has to be 2048 bit encryption certificate. 1) Open your IIS manager, click on your server in the left pane. 2) Click on "Complete Certificate Request". 3) Select the certificate .crt file, provide a friendly name and click on OK.
4) Double click on the generated .pfx file to import it in your computer (CurrentUser) store. 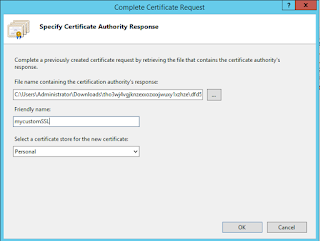 5) Open the certificate manager by typing certmgr in the Run window. 6) Open your personal store, you will see the imported certificate with the same friendly name you gave in IIS is imported into your machine. 7) Right click on the certificate, click on export. 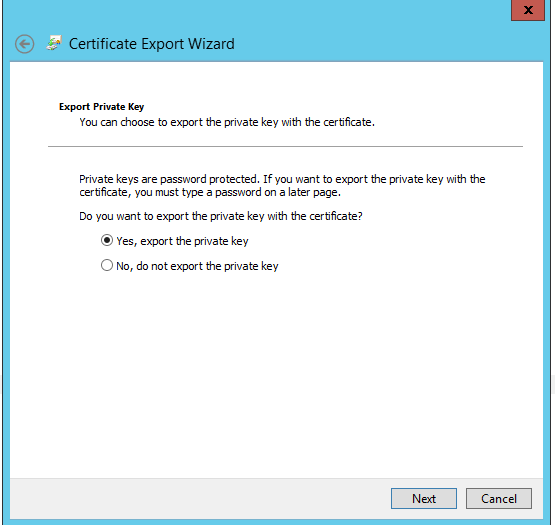 8) Make sure to select export the private key, save the generate SSL certificate with pfx file. Note: remember the password you set for the file since we will need this password when we upload the ssl certificate into Azure portal. 9) We will be using this generate certificate file (.pfx) to be configured in the cloud service and to upload in windows azure. 10) Login to Azure portal, click on your cloud service, select certificates tab. 11) Upload the ssl certificate we generated, and type in the password you previously set when you export the ssl in step #8. 12) This step is to associate the installed SSL certificate in the cloud service for certain web role. 13) From VS 2013 Solution explorer window, double click on the web role you would like to associate the SSL certificate to. 14) Click on Add Certificate. 16) Click on the thumbprint small button and select the SSL certificate. You don't need to copy the thumbprint value for the ssl, once you select the certificate, VS 2013 pulls this value and set it in the field. 17) Click on endpoints tab and add a new endpoint using https protocol and select the certificate associated with the web role we previously added in the certificates tab. 17) Save and deploy your cloud service, Test out accessing the cloud service web role using https! In this post i am going to show how to configure custom domains in azure cloud services. As you my have multiple web roles in your cloud service, you need to configure your website to use your custom domain. The way to configure custom domains in azure cloud services is different than the web apps. In the web app scenario you have custom domain option to set your configuration per web app. 1) Login to Azure Portal, Click on Cloud Services. 2) Select your cloud service. 3) Copy your cloud service Site Url. 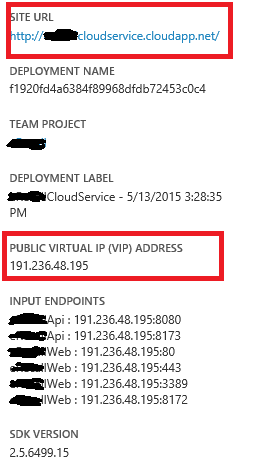 4) Copy your Cloud Service Public Virtual IP Address (VIP). 5) Login to your hosting/domain provider, access your control panel and edit the DNS entries for the domain you want to point to azure cloud service. Data: VIP of the cloud service. 8) Save your entries and give it few minutes or hours to propagate. I have been asked by clients: How to get started with Office 365 API Development ? They want to integrate office365 capabilities in their existing systems and applications. Hope this helps, and feel free to send any questions over to help. Today i have passed Microsoft exam 70-532 "Developing Microsoft Azure Solutions". I have been studying for awhile. I have been implementing Azure solutions since 2008. The preparation was just a mater of getting the exam materials, focus on the exam topic areas, and do lots of readings! I will provide all what you need to read, watch or most importantly is my study tips to pass the first exam in the Azure certifications for Developers and Architects. Microsoft Virtual Academy (MVA) has a course for this exam. Amazing course that cover all the basics of this exam, great conversations and discussions for these topics. It covers exam's topics and lots of demos in the MVA course and you need to do some exercise for all the topics they asked to read more about. Understand the factors that affect the cost (billing) when you store content in Azure CDN Services and how to control it. How to integrate with Azure AD Services through REST API. Hope this helps and best of luck for all of you!